Anfield L6 Dry & Steam Carpet & Rug Cleaning Services | Quality Property Care Ltd. Hiring a professional rug and carpet cleaning company, and using its services regularly is a very good idea, especially if you or someone in your household suffers from pollen or dust allergies or has respiratory problems. 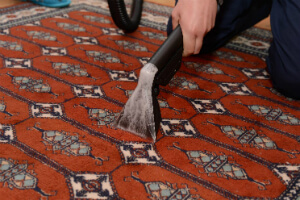 The quantities of dirt, dust, dust mites and germs in our rugs are actually quite alarming, so don’t wait to hire Quality Property Care Ltd., which provides a top quality carpet and rug cleaning service in Anfield L6 and the area. The rug and carpet cleaning company can also provide: blinds cleaning, curtain cleaning, drapery cleaning, as well as mattress cleaning and bed bug mattress treatment, which will help get rid of the dust mites, allergens and kill off all bacteria. The firm provides residential and commercial carpet and rug cleaning at a competitive price tag. To get a free price offer in less than 2 hours, just call the expert customer care support or use the online contact form. Don’t lose hope even if your favorite rug has suffered from what seems like a irreversible stain. The cleaners can successfully work with a huge range of not-so-common and common stains, including: wine, oily stains, paint, , blood, vomit, rust, tea, coffee, moth damage and many more. For more delicate materials like cotton and silk we use a more gentle approach which does not depend on heat or moisture to remove a stain. Natural materials rarely react well to both moisture and heat so we are using a special dry compound which comes in a granulated form. The same procedure of stain and rug or carpet prepping applies as was explained in the hot water extraction method, allowing us to much better remove the blemish. This time we pre-treat the stain with a specific detergent, specially selected for the sort of fiber we are cleaning. It’s put on and let to set into the stain. Once that is done we apply the granulated detergent and spread it with a fine brush. This imbeds it into the fibers of the material pushing it into the stain. The dry compound is also let to set for 10 minutes after which we get it using a high powered vacuum machine, extracting 100% of the filth and detergent and filth. There is no trace left behind, leaving both your carpet and natural rugs fully cleaned and spotless. Quality Property Care Ltd. offers deep rug cleaning to remove all residue, stains, dirt and allergens and to kill all the germs in your rugs and carpets. The professional carpet and rug cleaning is done by: hoovering, followed by steam carpet cleaning and highly efficient hot water extraction which removes all excess water from the rug or carpet. For precious rugs or rugs which can not be cleaned with water, the firm provides rug cleaning and dry foam cleaning to safely remove the dirt and restore the charm of your rugs. The expert services offered are appropriate for domestic and commercial properties too. There are many different rug and carpet types out there and we’ve made sure to be able to clean them all properly. Our specialists use a different strategy for all different types, which enables us to safely and properly clean both natural and synthetic fibres. We can clean linen, wool, cotton, synthetic,, organic fiber, viscose, silk, chenille, plush, suede, nubuck, leather, acrylic. With years we’ve managed to refine our stain removal procedures to a science allowing us to eliminate not only oily stains, paint, rust, blood, tea, wine, coffee, vomit, and moth damage, but also cope with synthetic and organic and synthetic stains. Book any time by calling 0151 673 0008 or posting a booking form on our site. Get in touch with us with no hidden fees and any obligations.